Does your child have sores on or in his mouth. This post will focus on Impetigo vs Hand Foot and Mouth Disease to help you decipher exactly what your child has. So the other day, my one-year-old came down with a fever. At first I thought he was teething or had a cold. 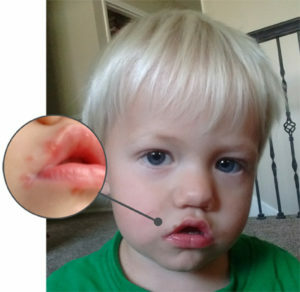 However, right after his fever broke, tiny little sores started to appear around his mouth and on his hands and feet. Earlier that week he had been playing with his cousin who came down with Impetigo (a contagious infection of the skin). So, I figured that he had caught it from him. Well, I was wrong. After talking to the nurse at his pediatrician’s office, it turns out he had Hand, foot and mouth disease (HFMD)! Both illness have some similarities and some differences. And both are fairly common among toddlers and babies. Listed below are some ways to recognize illnesses and how to treat them. My little squirt who got HFMD. The separate photo shows where the sores developed near his mouth. Hand, foot and mouth disease: It usually starts with a fever, reduced appetite, sore throat, and a feeling of being unwell. One or two days after the fever starts, painful sores can develop in the mouth. The mouth sores begin, often in the back of the mouth, as small red spots that blister and can become ulcers. A skin rash with red spots, and sometimes with blisters, may also develop over one or two days on the palms of the hands and soles of the feet; it may also appear on the knees, elbows, buttocks or genital area, according to the Centers for Disease Control. Impetigo: It is a common and highly contagious skin infection that mainly affects infants and children. Impetigo usually appears as red sores on the face, especially around a child’s nose and mouth, and on hands and feet. The sores burst and develop honey-colored crusts, according to the Mayo Clinic. Comparing both illnesses: After simply talking to the nurse over the phone, she knew my son had HFMD because he had sore INSIDE his mouth. Impetigo only produces sores on the skin itself. Also, since my son had a fever, that was also a big indication that it was NOT IMPETIGO. Also, since the sores were concentrated on the feet, hand, and mouth, that was a big indication of HFMD and not Impetigo. Sores on my son’s toes from HFMD (left). A large sore from Impetigo behind the knee of my nephew (right). Hand, foot and mouth disease: Unfortunately, there is no specific treatment for this disease. You’ll just have to let it ride its course. However, you can give your child some over-the-counter pain reliever and sprays for the mouth to numb the pain according to the CDC. The nurse from my pediatrician’s office recommended Mylanta to soothe the pain as well. My sister is big on essential oils and she recommended some Melaleuca oil for his mouth. I didn’t try that but might be a good option. Impetigo: The good news is Impetigo typically is treated with an antibiotic ointment or cream that you apply directly to the sores. You may need to first soak the affected area in warm water or use wet compresses to help remove the scabs so the antibiotic can penetrate the skin according to the Mayo Clinic. I hope the above information was helpful. Since I am not a medical professional I recommend consulting a medical professional before diagnosing or treating any illness. The websites below provide additional information about these two specific illnesses. Impetigo overview including treatment, prevention and symptoms and causes. Hand, foot and mouth disease overview including treatment, prevention and symptoms and causes. You can also print this FREE HANDOUT – Impetigo vs. Hand foot and mouth disease. Have you had any experiences with these illnesses? Leave your comments below. Thanks!